What I’m really saying is the immune system is a powerful machine to fight and prevent disease. A strong immune system is extremely important to fishes health and every aquarist must take the proper steps in providing these elements for success. The scope of this paper will briefly explain the most important elements needed to maintain a strong fish. First and foremost are the water conditions. Aquariums must be kept with the utmost care in order to achieve a high standard of water quality. Toxicity problems such as ammonia (NH4+), nitrite (NO2-), or low pH can be devastating to fishes health. These conditions will burn fishes eyes, scales, and slime coat. Remember the capacity of the host to resist disease depends on the maintenance of an intact physical barrier between the internal tissues and the environment. This is known as “natural resistance.” If the slime coat or eyes are damaged through toxicity problems, parasites and bacteria find their way in the host much easier. Low pH levels (acidic water) not only cause external damage, but also cause physiological stress. A sub-par pH will change the pH level of the blood inside the fish. Rapid operculum pumping tells us the O2 consumption is desperate and energy exhaustion may occur. The presence of natural resistors (or anti-bodies) in the blood, tissues, and mucus can diminish under physiological exhaustion. Fish, as with all animals, need natural resistors to fight off diseases. Under physiological stress, anti-body production is decreased leaving them susceptible to pathogens. These general practices may vary in accordance to 1) tank size, 2) number of fish, and 3) type of specimens housed. One should consult a local Aquarium shop or book for recommendations toward these guidelines in relation to the type of fish they may be keeping. What if we have sick or dead fish and the above water parameters are in check? Can the water conditions still be a problem? As a matter of fact, there are many situations where it occurs. Ammonia and nitrite are not present but dissolved organics are high, thus water conditions can still be a factor in fish’s health. Although nitrogen based wastes can be tested, organic waste bacteria, and viruses cannot. 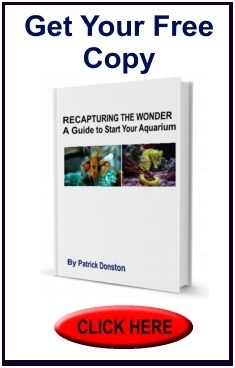 Lack of filtration or maintenance of the aquarium results in what I call “Dirty-water syndrome.” Tank water becomes saturated with organic waste known as dissolved organic carbon of DOC. Bacteria and viruses feed on this matter enabling them to propagate into large numbers. If the pathogen numbers are high in the tank-water, anti-bodies of the fish cannot fight as well, thus infections occur. Look at it this way; if we swim in crowded pools where filtration and chlorine levels are low, there are potential problems with sores on our skin. These occur from bacteria and viruses which are high in numbers of poorly maintained swimming pools. I don’t think we would swim in a pool, knowing there is a high bacterial-viral count. Dirty-water syndrome can be eliminated by following the guidelines I’ve stated in the previous section. Again I emphasize, if the DOC is high in the water, pathogens reproduce in great proportions, thus anti-bodies are out numbered and can’t fight disease no matter what treatment is used. We must have a clean tank to medicate fishes that are already infected with disease otherwise the medication is useless. If the immune system is the key to a fish healing from disease, then it goes without saying, anti-body production must always be a concern. Anti-bodies are enzymes (or proteins) produced by the immune system. These are the nutrients we feed out fish. Below I’ve listed the four basic nutrient groups. We must try to meet the fish’s dietary needs of all four groups in order to achieve sustenance, growth, and reproduction. Of course nutrient requirements vary from fish to fish. It is important to always feed a varied diet that ensures we are completing the nutritional needs. I can say from fist-hand experience that I have healed lymphocytosis, lateral-line disorder, Hexamita, and other bacterial infections by feeding dry pellets saturated with liquid vitamins. I credit this to the strengthening of the immune system. Live foods are not always the best solution for nutritional requirements. Studies have shown fish produce over 10 times the waste than if they were fed dry or frozen food. A soft dry pellet with low carbohydrate and ash content optimizes protein/energy ratio resulting in lower organic phosphorus and nitrogen excretion. The idea of a clean system by minimizing fish waste and a diet consisting of high-energy food is the pattern Aqua culturists follow. Carbohydrates are found almost exclusively in plants, thus an herbivorous diet should always be fed (even to carnivorous fishes). Large Cichlids or marine fish feed exclusively on live foods never look as healthy as if they were fed a varied diet of dried plant and animal matter. In conclusion, living organisms alter the composition of the water in which they live, and the resultant changes are sometimes harmful. The aquarist’s task is to recognize these changes and attempt to control them. Most of out knowledge concerning fish dietary requirements comes from experimental nutrition studies. These studies have demonstrated the relative importance of dietary proteins, lipids, and carbohydrates for growth and energy to run the bodily machinery. If these requirements are met, the fish will do the rest. -Patrick D.